If you’ve watched the WWDC keynote, you should be amazed by an innovative feature called Playgrounds that allow you to experiment Swift and see the result in real-time. In other words, you no longer need to compile and run your app in the Simulator. As you type the code in Playgrounds, you’ll see the actual result immediately without the overheads of compilation. At the time of this writing, Swift has only been announced for a week. Like many of you, I’m new to Swift. I have downloaded Apple’s free Swift book and played around with Swift a bit. Swift is a neat language and will definitely make developing iOS apps more attractive. 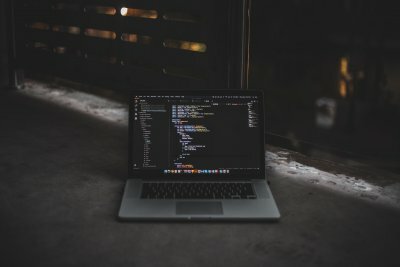 In this post, I’ll share what I’ve learnt so far and the basics of Swift. These are the two keywords you need to know for variable and constant declaration. You simply use the “let” keyword for storing value that is unchanged. Otherwise, use “var” keyword for storing value that can be changed. 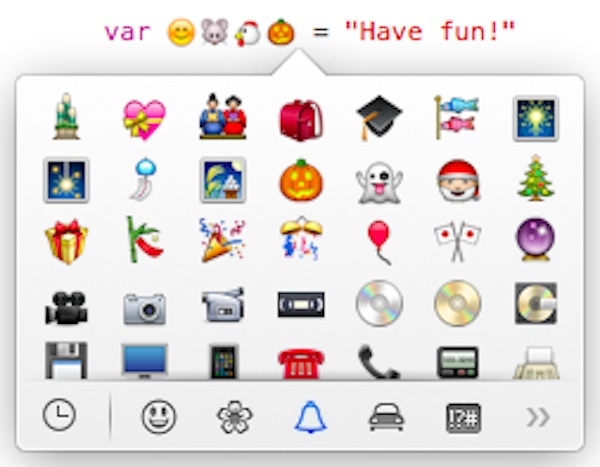 Tip: You may wonder how you can type emoji character in Mac OS. It’s easy. Just press Control-Command-spacebar and an emoji picker will be displayed. You may notice a huge difference in variable declaration between Objective C and Swift. In Objective-C, developers have to specify explicitly the type information when declaring a variable. Be it an int or double or NSString, etc. It’s your responsibility to specify the type. For Swift, you no longer needs to annotate variables with type information. It provides a huge feature known as Type inference. The feature enables the compiler to deduce the type automatically by examining the values you provide in the variable. var myMessage = "Swift is the future!" var myMessage : String = "Swift is the future!" In Objective C, you need to end each statement in your code with a semicolon. If you forget to do so, you’ll end up with a compilation error. As you can see from the above examples, Swift doesn’t require you to write a semicolon (;) after each statement, though you can still do so if you like. var myMessage = "No semicolon is needed"
let dontModifyMe = "You cannot modify this string" var modifyMe = "You can modify this string"
let dontModifyMe = "You cannot modify this string"
var modifyMe = "You can modify this string"
In Objective C, you have to choose between NSString and NSMutableString classes to indicate whether the string can be modified. You do not need to make such choice in Swift. Whenever you assign a string as variable (i.e. var), the string can be modified in your code. let firstMessage = "Swift is awesome. " let secondMessage= "What do you think?" Swift automatically combines both messages and you should the following message in console. Note that println is a global function in Swift to print the message in console. Swift is awesome. What do you think? You can do that in Objective C by using stringWithFormat: method. But isn't the Swift version more readable? String comparison is more straightforward. In Objective C, you can't use the == operator to compare two strings. Instead you use the isEqualToString: method of NSString to check if both strings are equal. Finally, Swift allows you to compare strings directly by using the == operator. Like NSArray, the Swift provides various methods for you to query and manipulate an array. recipes += "Thai Shrimp Cake"
To access or change a particular item in an array, pass the index of the item by using subscript syntax just like that in Objective C.
var recipeItem = recipes recipe = "Cupcake"
This changes the item 2 to 4 of the recipes array to "Cheese Cake", "Greek Salad" and "Braised Beef Cheeks". To iterate through a dictionary, use the for-in loop. You can also use the keys and values properties to retrieve the keys and values of the dictionary. Now the companies dictionary contains a total of 5 items. The "TWTR":"Twitter Inc" pair is automatically added to the companies dictionary. Similar to Objective C, right? In the above example, we define a Recipe class with three properties including name duration and ingredients. Swift requires you to provide the default values of the properties. You'll end up with compilation error if the initial values are missing. 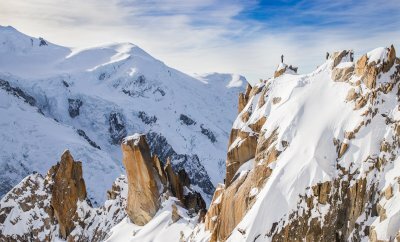 What if you don't want to assign a default value? Swift allows you to write a question mark (?) after the type of a value to mark the value as optional. You use the dot notation to access or change the property of an instance. Swift allows you to subclass Objective-C classes and adopt Objective-C protocols. For example, you have a SimpleTableViewController class that extends from UIViewController class and adopts both UITableViewDelegate and UITableViewDataSource protocols. You can still use the Objective C classes and protocols but the syntax is a bit different. Control flow and loops employ a very C-like syntax. As you can see above, Swift provides for-in loop to iterate through arrays and dictionaries. You can use if statement to execute code based on a certain condition. Here I'd just like to highlight the switch statement in Swift which is much powerful than that in Objective C. Take a look at the following sample switch statement. Do you notice anything special? Yes, switch statement can now handle strings. You can't do switching on NSString in Objective C. You had to use several if statements to implement the above code. At last Swift brings us this most sought after utilization of switch statement. The switch cases now lets you check values within a certain range by using two new operators: "..." and "..<". Both operators serve as a shortcut for expressing a range of values. Consider the sample range of "41...70", the ... operator defines a range that runs from 41 to 70, including both 41 and 70. If we use the ..< operator instead of ... in the example, this defines a range that runs from 41 to 69. In other words, 70 is excluded from the range. Should I Still Learn Objective C? I hope this short tutorial gives you a very brief introduction of Swift. This is just the beginning of the Swift tutorials. We'll continue to explore the language and share anything new with you. 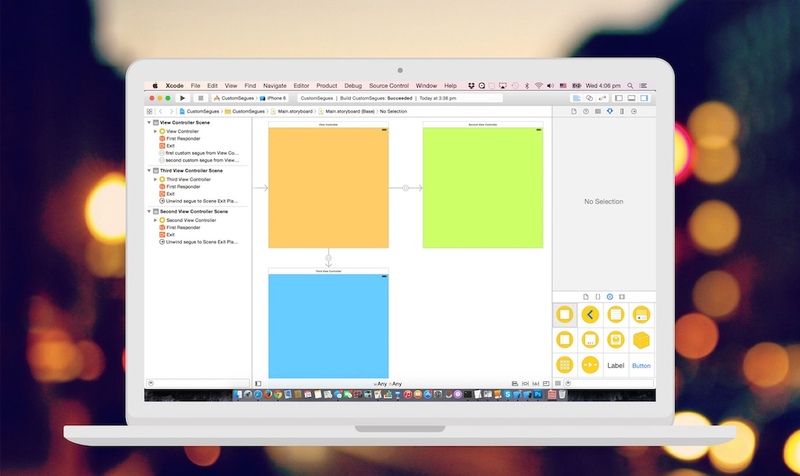 Of course, we'll develop more detailed tutorials when Apple officially releases Xcode 6 and iOS 8 this fall. Meanwhile, if you want to further study the language, grab the free Swift book from iBooks Store. Before I end this post, I'd like to take this chance to answer a common question after the announcement of Swift. Should I continue to learn Objective C? My view on Swift is it is the future of programming for iOS. Apple will continue to promote and add features to the language. As you can see in this tutorial, the syntax is more developer-friendly and it's easier for beginner to learn, particular for those who have scripting background. It will definitely encourage more people to learn iOS programming and build iOS apps. That said, I think Objective C will not disappear overnight and is here to stay for years. There are tons of apps and code libraries that are written in Objective C. It'll take time for developers to convert the code to Swift. As Xcode supports both Objective C and Swift, some developers may even keep the existing code in Objective C and only develop new library/app in Swift. Thus, I suggest you to learn both languages. If you can manage the fundamentals of Objective C, it'll be very easy for you to switch over to Swift as the two languages are quite similar. And it would definitely give you an edge over other Swift-only developers in the market. What do you think about Swift? Leave me comment and share your thought. I think objective-c will become history so it will be good to go with swift as quick as we can,thanks for tutorial Simon. the only concern for me on ObjC is the current library we are using…e.g. AFNetworking, seems we have to wait for some time to let them provide swift ver. You should be able to intermix Obj-C controls and Swift controls. So AFNetworking should run, as is for a long while.. Swift seems to be more readable language compared to objective-C..Thanks for the introduction. Great stuff, Simon – you are the best! I agree completely – Swift is the way to go and it is likely to go faster than any of us imagine. That said – a good grounding in Objective-C and the basics of Object oriented programming will help you get going…..as well as *lots* of hands-on practice! Your iOS 7 material is just superb and I cannot wait to get your iOS 8 material! Thanks for your kind words! We will definitely publish more iOS 8 tutorials when Apple officially releases iOS 8 in Sep/Oct. We wish to publish detailed tutorials on Swift. However, under Apple’s NDA, developers are not allowed to post any screenshots of iOS 8 / Xcode 6 beta. For now, we can only talk about Swift as the information is publicly available. Great intro to Swift. Cohesive, and yet, a bit more filling than the Apple docs/examples so far. Thanks! Can anyone comment on using third-party libraries with swift? As in with tools like cocoapods? are you sure is not “1 to 3”? Don’t confuse the index with the number of the item. Index 1 is item 2, as index 0 is item 1. You think there will be a book for IOS 8 by this fall? Yes, we’ll publish one in this fall. If you don’t want to wait, you can grab the current AppCoda book (http://104.131.120.244/book/learn-ios7-programming-from-scratch.html) and you’ll receive free update when iOS 8 is released. All the stuffs covered in the book still apply in the next version of iOS. Swift is simply a different language with different syntax. You still need to learn the APIs in the iOS framework, which are mostly written in Objective-C. If you have web development experience, it may be easier for you to pick up Swift. But as I always mentioned, it would be better to learn both languages. I My suggestion for you is to start with the Hello World tutorial. After going through the Hello World series, you’ll familarize with the Xcode environment and have a very basic understanding of Objective-C.
Good to know that Apple introduced this, This language is more readable unlike objective c with wierd syntax compare to other programming languages. I love to see this evolve. I like to learn this instead of obj-c.
can Swift be mixed with Objective-C? Yes, Swift is designed to work side-by-side with Objective-C. You can mix both Objective-C and Swift in the same Xcode project. if I have zero-knowledge on Objective-C, is it possible to just learn Swift? Yes, you can learn Swift directly. However, while I love Swift, I encourage you to grasp the basics of Objective-C. Swift is just the programming language. In order to create an app, you still need to study the frameworks and learn how to use various APIs. The frameworks are mostly written in Objective-C, so as the documentation. If you have some Objective-C background, it would be easier for you to understand the SDK and build an app. Is swift gonna replace objective c? I just started learning objective c. Is it gonna be like, they do not need objective c developers any more? How important will be the role of objective c developers in near future along with swift? As said, I don’t think Objective-C will disappear overnight. There are tons of code written in Objective-C. They still need someone who understands Objective-C to maintain. That’s why I always encourage people to learn both languages. But if you just want to pick one, Swift is a good choice. Yes, you can develop iOS apps using Swift. In the future, Swift is going to completely replace Objective C.
What would you suggest somebody who comes to you after 8-9 years and wanted to become an iOS programmer? Would you suggest them to go with swift or objective c? Great intro tut into Swift 🙂 Thanks a lot. I think half-closed range operator has changed from “..” to “..<"
Hi, I’m completely new to programming and would like to learn quickly and efficiently. I’m wondering how many of the objective c lessons I need to do before I take on swift, because swift is simpler then the programming languages in the past. Am an Android developer.. it was tough to cope up with Objective-C.. Thanks to Apple for swift 🙂 Swift is super cool and easily readable ..
Great Post.. But my question is what about all the frameworks and classes which we are currently using.? Before starting to learn Swift I felt like ObjC was far from disappearing. But the more I play around with Swift, the more I feel like developers are quickly going to develop their new apps with Swift and let aside ObjC. I really wouldn’t be surprised considering things move so fast with iOS ! Btw, the “…” already existed in C/ObjC 😉 I discovered that about a year ago, and was quite surprised I hadn’t encountered that syntax before. Keep up the good work btw ! Great Tutorial and good comparison with Objective C. Really good one for the beginners like me..:) Thanks. Great Post 🙂 thank you. If you update this post it will be more useful. Hi very good explantation about Swift and Comparison with objective-C.thankQ so much. It’s really very helpfull to who want to know the basic differance b/w Objective-C and Swift. Hi Dear Good Day I know Only Xcode In Marvics Version. But I Know Swifit Programming Is Easy But How To Run And What Software Is Required please help me. For output statement “println” is no more used, now “print” function is used. nice but this language is based on c++ i think. i am little bit poor at c++. I worked in objective-c so , should i learn c++ or on your think it is easy for me to convert on swift easily ? I think you should directly learn swift. Its easy!